When submitting an article for publication in nursing and medical journals, you may need to use AMA style. But few nursing or medical programs require students to actually buy the AMA style manual. That's a problem that the resources below can help you get around. Each resource has been created or selected because it will teach you to use a different aspect of AMA style with which students consistently struggle. 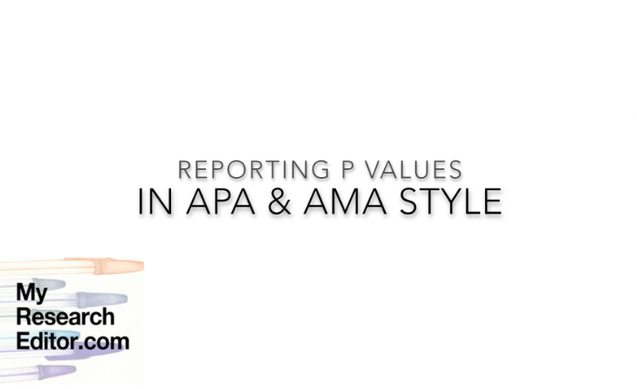 Reporting P values in APA is different from reporting them in AMA style. Do you know how they differ? Watch this video and you'll find out. Click the image below to go to the video page. Students are constantly baffled by the rules for introducing acronyms in text. This link explains the rules from the AMA's perspective. Click here to visit this resource [a new tab or window will open in your browser]. EndNote frequently spells out journal names when they should be abbreviated, even when "AMA style" is selected as an output style. Click on “Styles 4” on this linked page and you can see exactly how to correct these journal-output mistakes in EndNote. Click here to visit this resource [a new tab or window will open in your browser]. Many online resources say they are showing proper AMA style for references, but they really are not. This clean, simple resource, however, shows the real thing. Click here to visit this resource [a new tab or window will open in your browser].